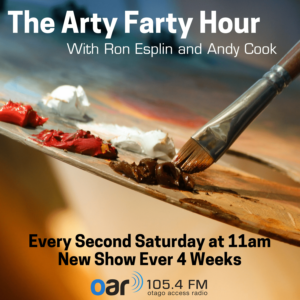 Join local artists Ron Esplin and Andy Cook as they explore the world of art, digging up facts, busting a few myths and talking with guests from a wide range of backgrounds in the arts. From a step-by-step guide to watercolour painting to an art clinic, the Arty Farty Hour gives you a chance to indulge your creative side. Proudly supported by Art Zone.